Let the children show you how yoga is done! Despite being more of a physical exercise for adults, yoga for children possibly has more benefits for their brain and mind. 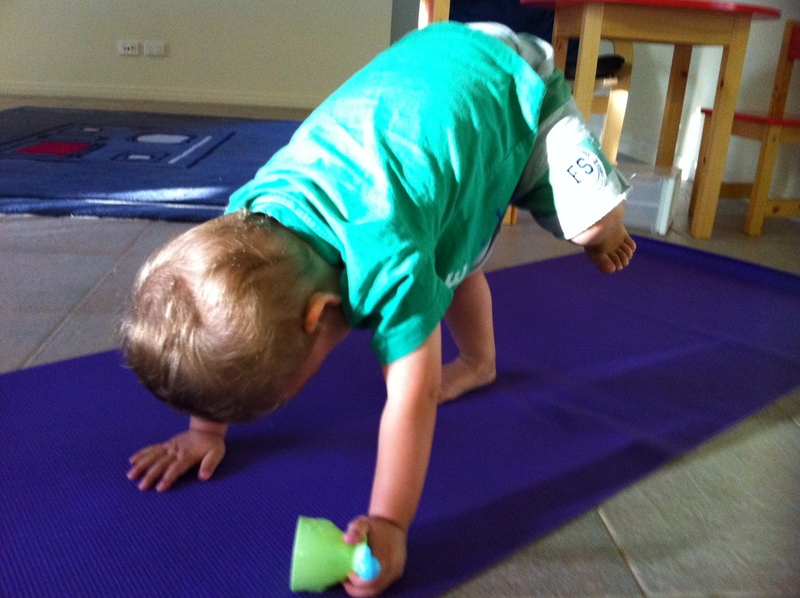 Let’s first look at the benefits of introducing yoga to your little ones. What’s in it for them? No age is too young to start! Yoga connects the body, mind and spirit. Children are very in touch with their intuition at a young age however, our early education system promotes a focus on the child’s ‘mental body’. Children are prompted to learn literacy and numeracy from a young age. Shifting their attention to these cognitive tasks, draws attention away from important right brain development which is responsible for creativity and imagination. It is also the reason that many of us as adults have lost our ability to use our intuition, creative skills and the ability to just ‘feel’. Yoga helps children to access their ‘spiritual body’, to be creative, to use their ‘gut instinct’ and their senses, by paying attention to their breathing, body and surrounding environment. Yoga promotes increased focus and attention. It provides your child with a useful toolkit of self-calming strategies, particularly teaching how to breathe and relax. It is also a useful strategy to promote mindfulness. See more about mindfulness here. 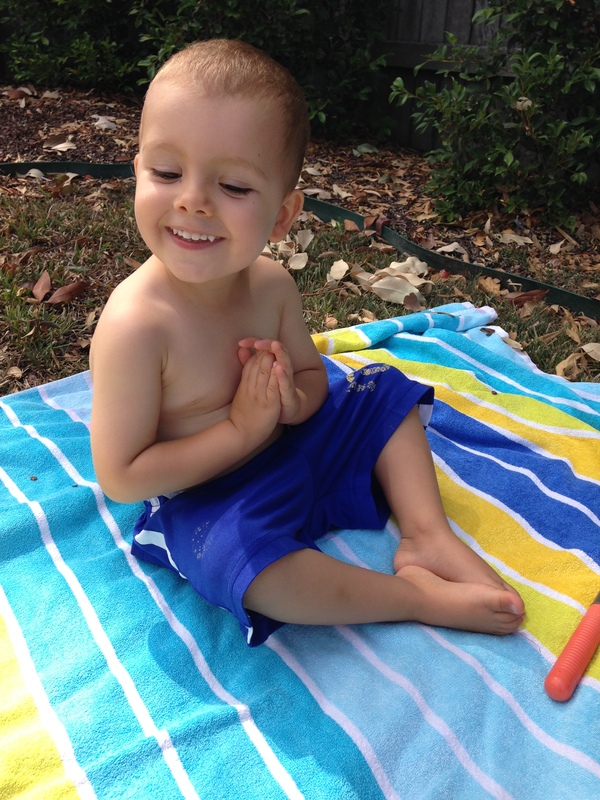 Yoga teaches your child about body awareness. Brain development occurs very quickly when a child has to work out where their body is in space. How do they move their body to get into THAT pose? And from cobra pose on their tummy, to downward dog on their hands and feet, to baby pose on their back? 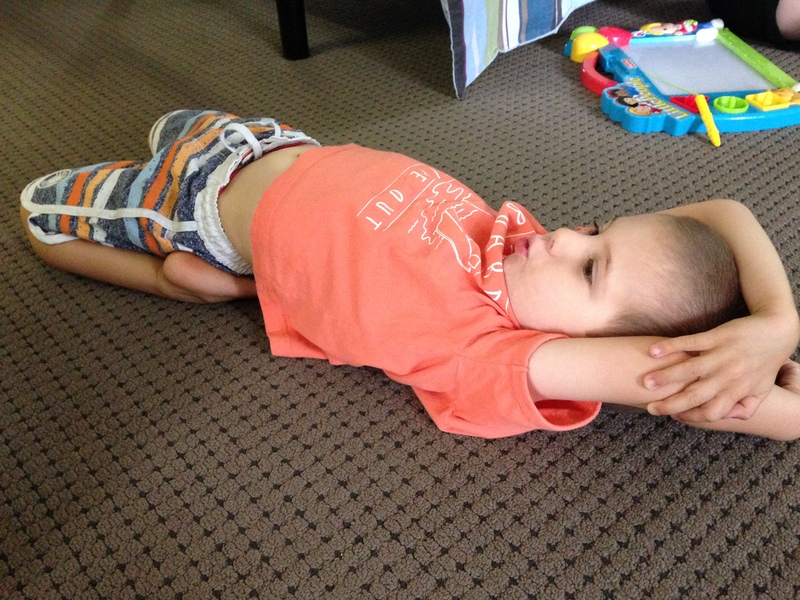 Body awareness is also developed when talking about the different body parts and explaining where to put each. This might be ‘put your hand down next to your foot’ or ‘now turn your shoulder up to the sky’. my feet where? hands where? Yoga promotes respecting the environment, and others. 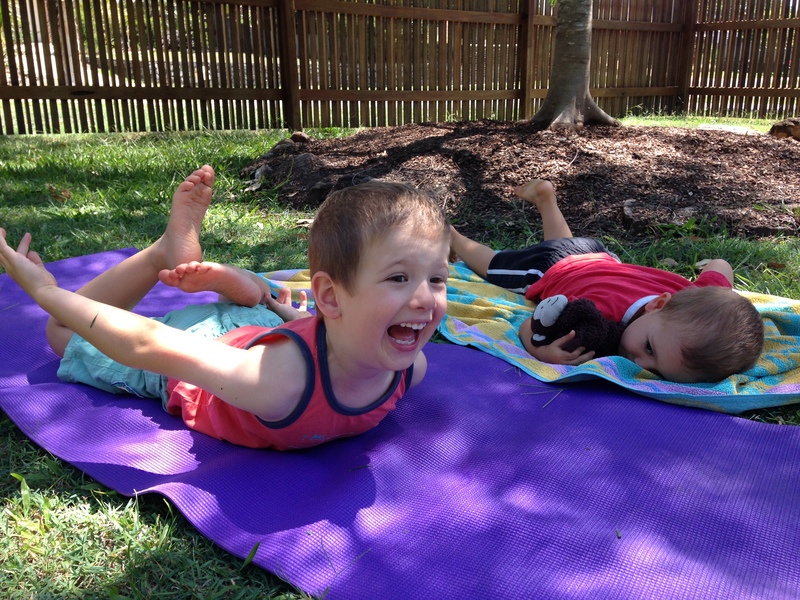 Yoga is done cooperatively together, not competing against other children. 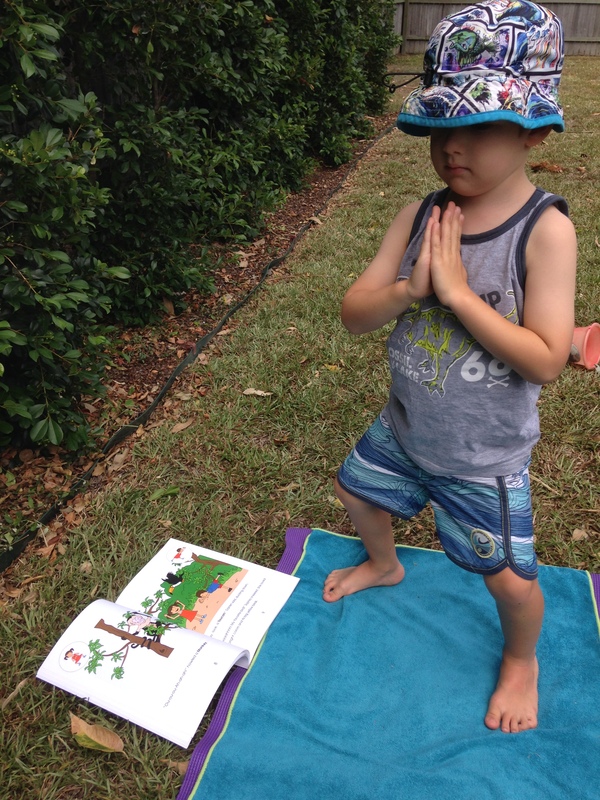 It is ideally performed outside where children can take notice of the environment (the wind, the trees, the wildlife, the weather), whilst they are doing yoga. And of course strength and balance comes with yoga. Kids are just maintaining flexibility! So what happens in Kid’s Yoga? Just one of the many titles from Giselle Shardlow! ooh they saw a ‘monkey’! Being like a tree… and not thinking about it too much! 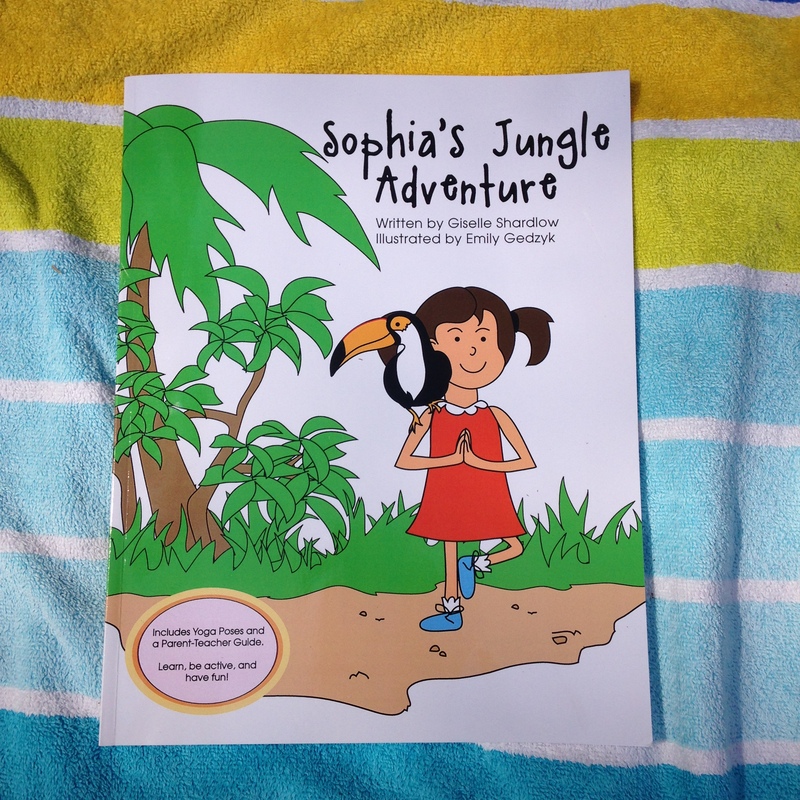 They feature adventure-style stories which feature a character who not only cares for the environment but also stops to do a yoga pose or two on each page of the story. This gives children something visual to go by but also a theme to help them visualise the pose they are attempting. So when your child goes on a jungle adventure, they might end up doing ‘cat’ pose for a jaguar or if they went on a beach trip, they would end up doing ‘warrior’ pose for ‘surfing’. This is how Kids Yoga sessions compare with an adult’s session. 1. Set up – yes a yoga towel or mat + a drink bottle is still ideal. 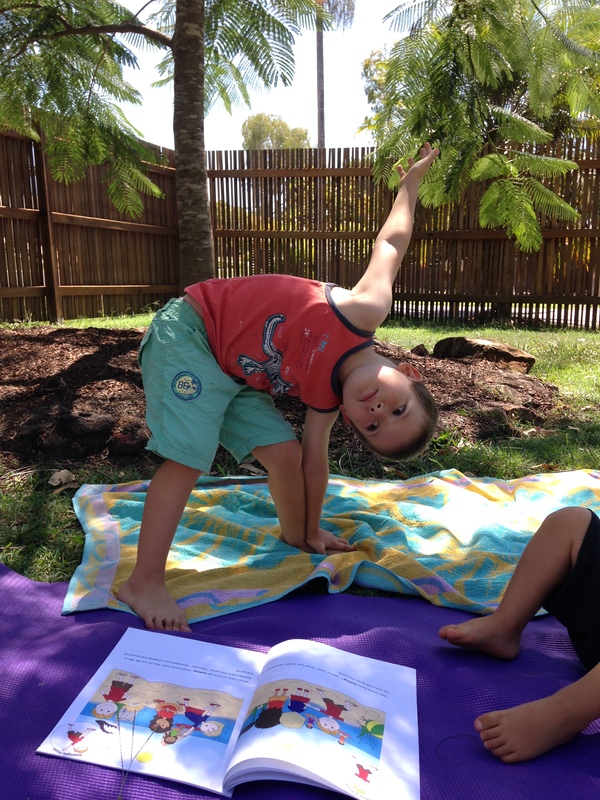 A Kids Yoga Story really does hold their attention however you could certainly attempt your own stories once you are familiar with some of the poses. Or go online for some inspiration too. We love to do yoga outdoors so we can be with nature and notice the environment with all of our senses, but inside is good if the weather isn’t great! 2. Music – no, you don’t have to stick with any particular type of music. 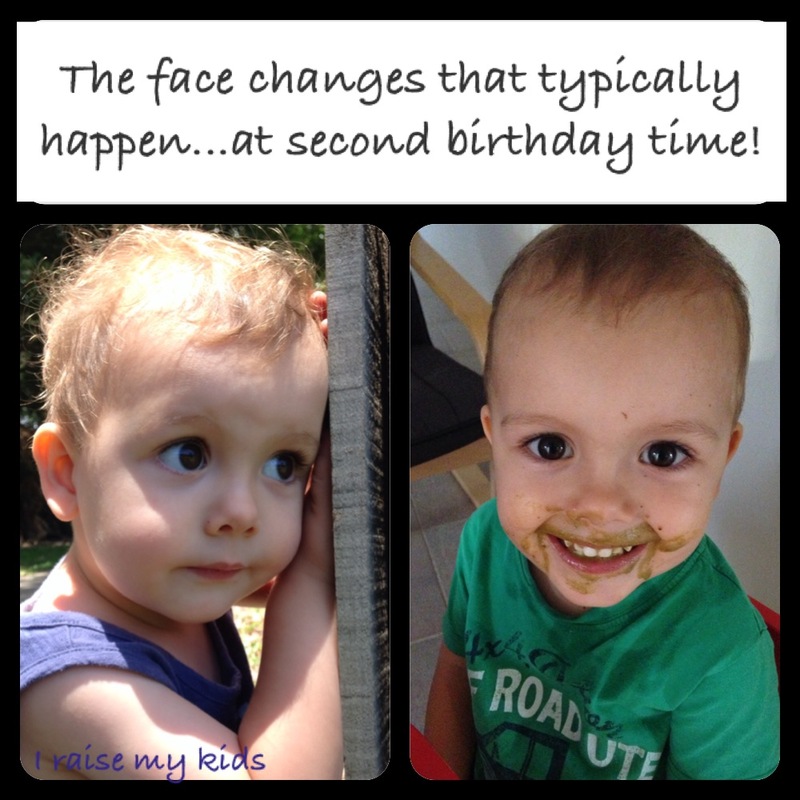 Whatever gets your children inspired in the theme is a great choice. But do think outside the box. The Wiggles Beach Party songs might be a first pick, but could also be distracting. The Beach Boys is a different alternative. You could even create a playlist of all of the songs that relate to say ‘the jungle’. Or you could just put on ‘rainforest’ songs or classical music. OR you could just go with the sounds around you. 3. Preparation – not so much on body and breathing, but of the story and theme. Taking the time to discuss what you might expect to see on your adventure gets children into the theme even more so and excited to look at the book. Don’t forget to remind your children about their surroundings and to use their senses. 4. Structure – this one does go out the window with kids! 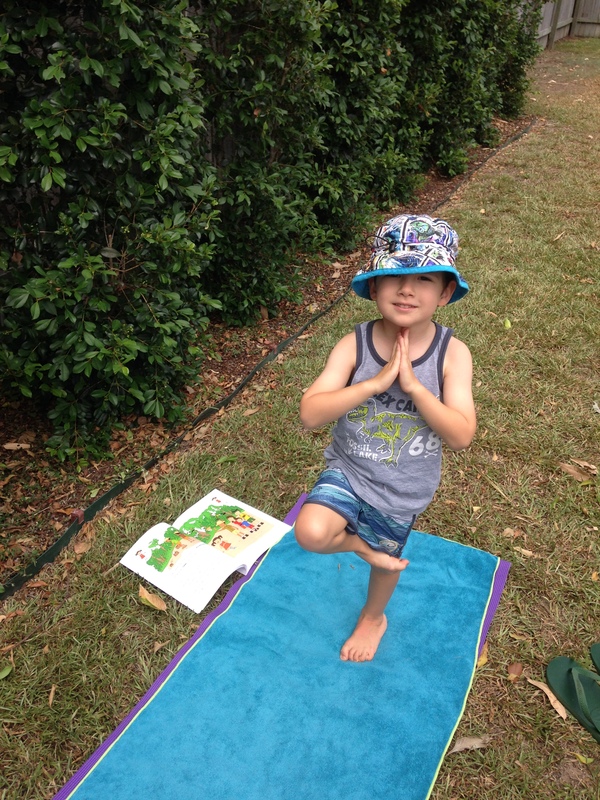 But the great thing is, sometimes the children will show you how they like their yoga sessions to flow. And as long as they are still enjoying yoga and receiving any of the benefits listed above, you can let go of following the story exactly or doing the pose so precisely. 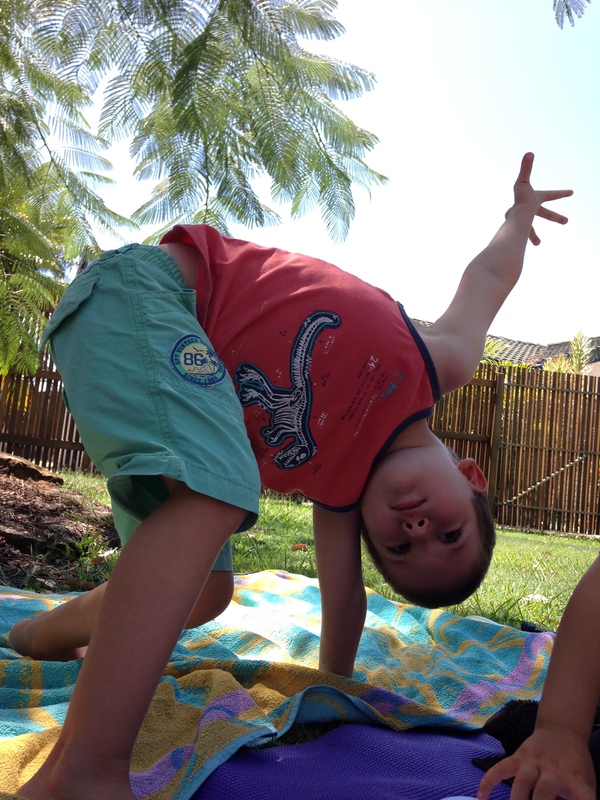 Let your children show you how kid’s yoga is done! 5. 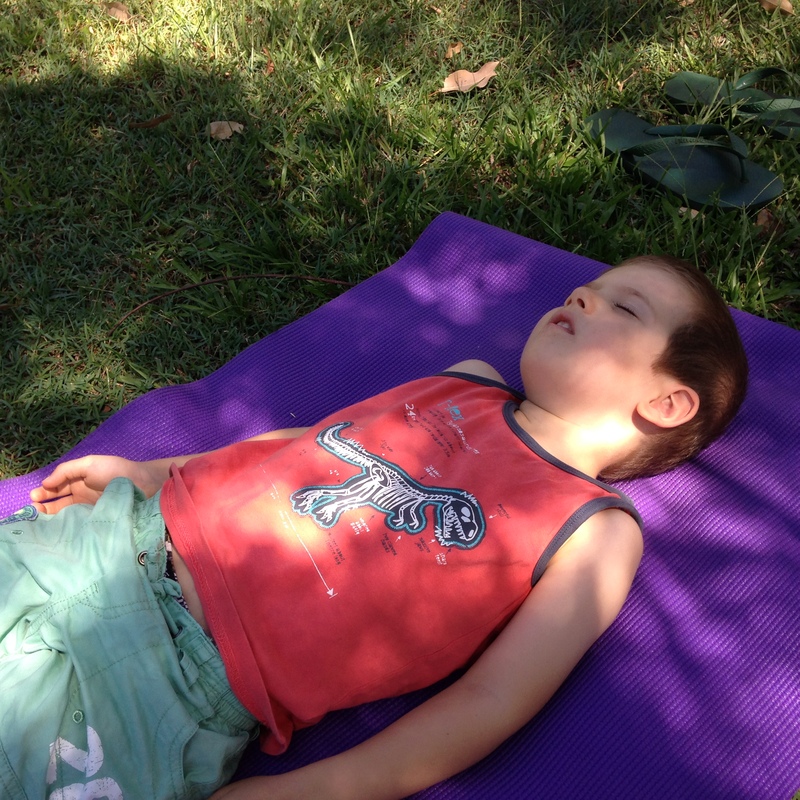 Taking time – there is no rush with kid’s yoga. If the kids stop to go and grab a stick for a prop or if they decide they would like to enjoy their rest and watch the clouds for longer at the end, that is what happens. As long as you are enthusiastic and accepting of their ideas, they will run the session in their own way! taking the time on his own..
6. Post-yoga activities – the list is endless of what you could carry onto. Morning tea on the towels noticing the trees or clouds or birds is a great way to stay ‘mindful’ and relaxed. Other activities could be continuing the yoga theme (such as ‘the beach’) and exercising the right brain with some painting, drawing or playdough modelling. Make use of the towels in summer and let the kids have fun blowing bubbles in cups with straws until their hearts are content! Blowing involves breathing and the diaphragm which promotes further relaxation. Alternatively, you could think about a theme for the next yoga session. 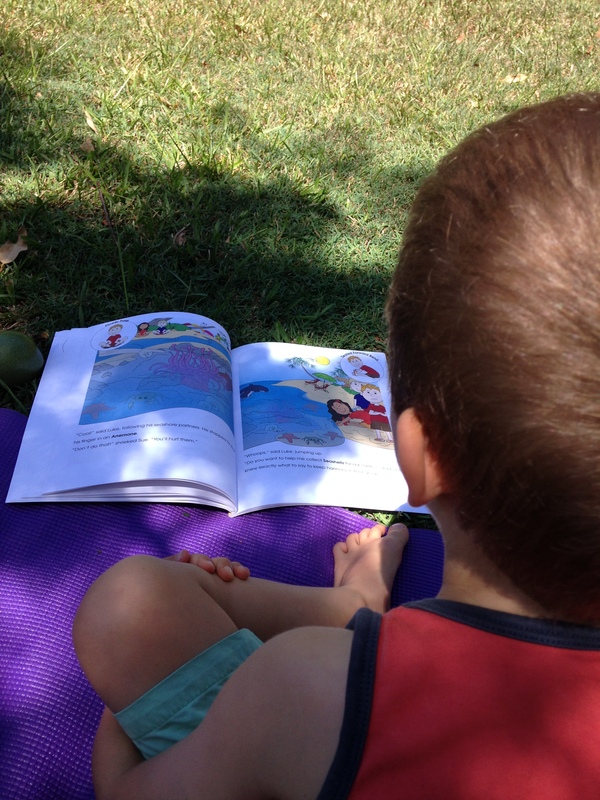 For those interested in one of the Kids Yoga Stories to get them started, here is the website http://www.kidsyogastories.com/. Enough with the left brain and more of the right brain! 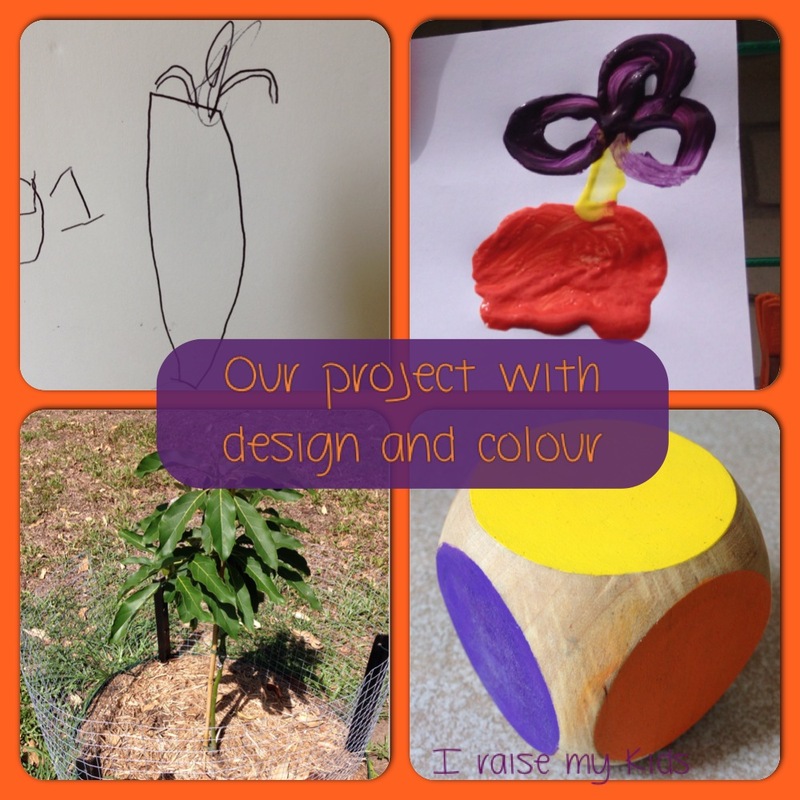 We began with our morning tea in the garden and discussed the art project : to draw an item and then paint it too. Master 4 chose our new ‘child’, our avocado tree. We got out our beautiful rainbow dice (Thanks Apple n Amos) and decided to pick three colours for our project. Here is Master 4’s results. And of course this project lead into experimentation with these colours and the feel of paint, particularly for Master 2. But that is another story! I encourage everyone to try this. You could do lucky dip for colours or even have a go at the project yourself. Or check out Apple n Amos!